My computer just crashed and, unfortunately for me, I don't have a backup copy of RGreatEx! The company that develops RGreatEx, SafeDevelop, seems to have vanished, but there may or may not be some relationship to JetBrains? There are some indications that the RGreatEx functionality will be incorporated into R# 5.0, but EAP builds of R# 5.0 are not yet available. So I'm stuck without one of my favorite tools. Is there some way to get a version of RGreatEx that will work in VS 2008 and R# 4.5? I purchased RGreatEx 1.1 in March 2008 and have a license file if that helps. I attached RGreatEx and .NET Code Inspector installers to this message. How about those of us who would like to buy / trial RGreatEx? We suggest to wait for ReSharper 5 EAP. It should start in October. AD> How about those of us who would like to buy / trial RGreatEx? 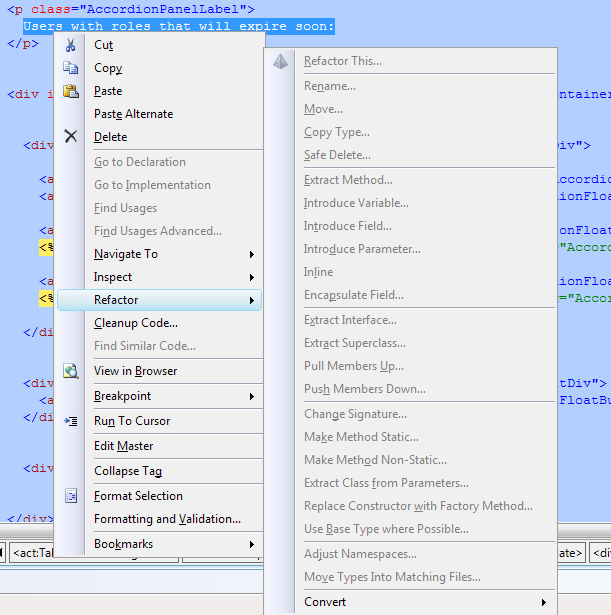 I'm using Resharper 5.0, but am not seeing a context menu option to extract strings to a resource file in .aspx files. The version of RGreatEx attached to this post won't install for v5.0 (the RESHARPERVERSION=5.0 switch is apparently ignored). Is it possible to install this extension, or is the ability to extract strings from an .aspx file to a localization resource file available in Resharper somewhere I'm not seeing it? Is .NET Code Inspector included in the release? IR> RESHARPERVERSION=5.0 switch is apparently ignored). IR> available in Resharper somewhere I'm not seeing it? IR> Is .NET Code Inspector included in the release? The 'Refactor This' command is always greyed out when I select text I want to localize on an aspx page. You could use context action "Move HTML to resource" for selected static html.